the teachers of the law and the elders mocked him. “He saved others,” they said, “but he can’t save himself! He’s the King of Israel! Nobody likes being mocked. It is even worse when one is at ones weakest and most vulnerable. And these were terrible taunts. “He saved others but He can’t save Himself.” Here was an acknowledgement of Jesus great power and authority in healing the sick, casting out demons and even raising the dead. Some of them may have both seen and heard of his raising Lazarus who had already been dead for four days. And they still would not accept the implications of these great acts. 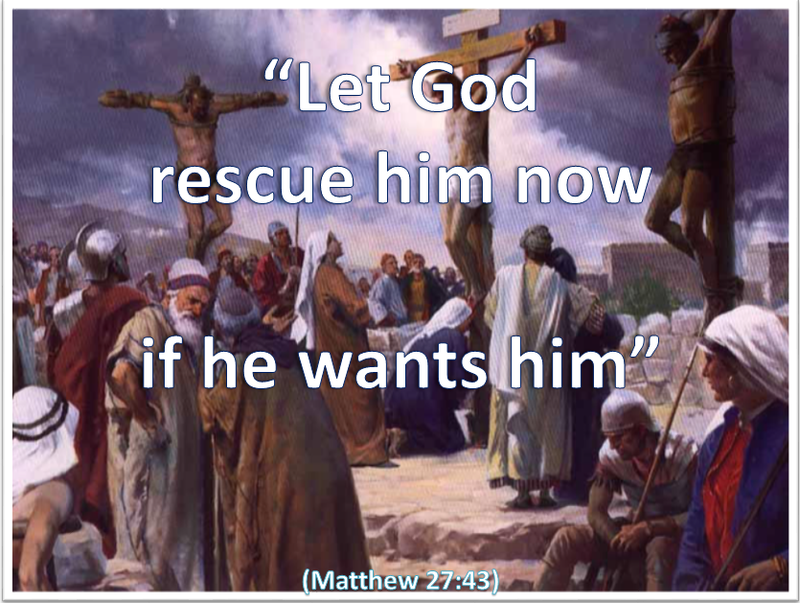 And of course Jesus could have saved Himself – but in obedience He chose not to. “He is the King of Israel.” They knew who He was said to be but they would not look at the possibility of it being true. They just did not want Him or a King like Him. And of course they saw that they had so much to lose in terms of status and privilege and power. “Let God rescue Him now if He wants Him.” ‘If He wants Him”- This may have been the cruellest barb of them all. It was directed at a pain-wracked man hanging naked and bleeding on the cross – a man who was soon to cry out as He felt Himself forsaken by the very God whom He trusted and served. And of course the religious leaders were trying to justify themselves to each other even then. Did the religious leaders recognise that they were quoting the prophetic words of Scripture? They should have – which would have made their mockery even more biting and tragic. “He trusts in the LORD; let the LORD rescue him. How easy it is to mock others and in particular the weak and the helpless – and to twist the knives of our sarcasm and scorn with the intention to cause the most pain and rejection. We imagine that somehow it makes us more important and secure. May God forgive us too. Categories: Christianity, Daily Life, God | Tags: Cross, Daily Bread, Forgiveness, Jesus, Lent, Love, Matthew, Perseverance, Scripture | Permalink.